This indicator reports the total hectares of farm land across Canada. Farm land provides a critical foundation for food security and Canada’s agriculture-based businesses. 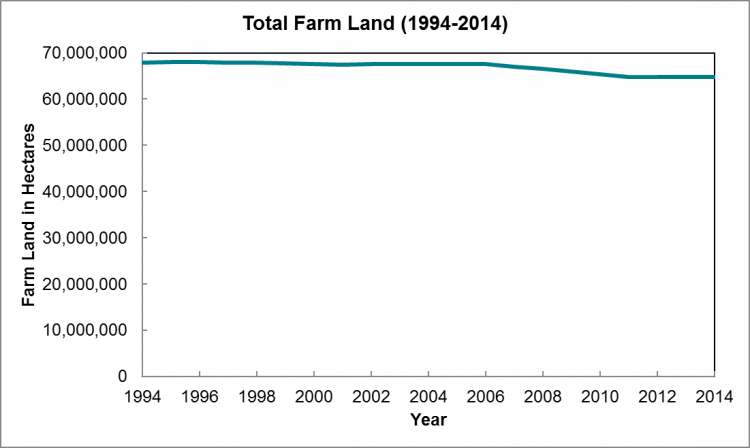 The total amount of farm land across Canada was fairly consistent between 1994 and 2006; but, between 2007 and 2011 a decrease in this type of land use is observable. This may have been influenced by the economic crisis of 2008, which financially challenged the agricultural and other industries. As mentioned, farmland is important to food production and the food security of Canadians. As well, local food movements are encouraging people to eat food grown near their homes. As a result of doing so, food is generally fresher and more nutritious, and the amount of fossil fuels typically needed for food transport can be reduced. Consequently, we view greater hectares of farm land as a positive indicator of environmental wellbeing.